The Carved chair reflects its designer's interest in exposed structural frames. The sleek surfaces and soft edges are complemented by a gently curved back and slightly tapered legs. These elements, along with generous seating proportions, make for an inviting seating statement. 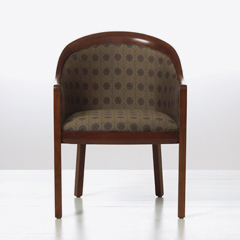 Carved is available French upholstered or with open arms and an upholstered seat and back.